Paul Pogba v Jose Mourinho: What ‘things’ was the Man United midfielder referring to? The midfielder made it clear that all is not well at Old Trafford following a concerted campaign by his manager to cast doubt over his performances. Mourinho made sure to congratulate Pogba for his season-opening performance on Friday night. IN MANY WAYS, Jose Mourinho’s behaviour towards Paul Pogba on Friday night was like that of a man doing everything he could to express his commitment to his partner. With Pogba having been apparently lined up with a potential move away from Manchester United by his agent, Mourinho was clearly keen to make nice in front of the 74,000 in attendance for the game against Leicester City. First he handed the midfielder the captain’s armband for the first time in seven months, then when he withdrew him shortly before full-time he led the applause in recognition of the Frenchman’s performance and made a very deliberate display of patting him on the back and reaching out for a handshake. Pogba’s inclusion was a special measure due to the fact he had only been back in training for four days following his successful World Cup campaign with France. And, with all of the talk of a fall-out between player and manager in the air amidst a difficult summer for the club, United needed the kind of solidarity Mourinho seemed ready to present. But Pogba apparently had other ideas judging by his post-match comments in which he shattered the illusion of a temporary detente between himself and Mourinho. For a start he spoke of his pride in representing the club and the fans both in conversation with reporters and in a post on social media, on both occasions omitting his manager. He also sent further cryptic messages in the post-match mixed zone. “You have to know one thing: a player that gets chosen and is happy, you always feel more comfortable than when he’s not happy. That’s all I say,” Pogba said when asked by reporters whether his performance was proof that everything was back on an even keel. These ‘things’ appear to be a combination of issues which came to the fore during last season as Mourinho played with United’s destiny in sending the 25-year-old a message. Pogba’s nose was put out of joint when the Portuguese publicly castigated some of his performances in the spring and then preferred young Scott McTominay to him in a number of key games, most notably both legs of the Champions League exit to Sevilla. The game which had seemingly sparked the unrest was the 2-0 loss to Tottenham in January, the first league match following the big-money arrival of Alexis Sanchez. The Chilean’s transfer from Arsenal was completed after United agreed to pay a basic wage of £350,000 plus appearance bonuses, meaning Sanchez replaced Pogba as the club’s highest-paid player. Next up, a suspiciously-timed illness saw Pogba miss the FA Cup visit to Huddersfield and Mourinho’s praise of his replacement McTominay was indirectly damning of the flashy French midfielder. Pogba would then fail to start the away leg against Sevilla in the round of 16 in Europe and when the return game came around he again found McTominay favoured after he had missed the previous weekend’s league win over Liverpool due to injury. United were dumped out by the Spaniards and Mourinho was quick to blame the “football heritage” which had preceded him at Old Trafford rather than have the spotlight directed at his treatment of the £89.5 million man. Generally, Pogba’s form improved towards the end of the season, but his two-goal rescue mission away to Manchester City was balanced out by a key miss late on in the FA Cup final loss to Chelsea. Still, he and his agent Mino Raiola would have hoped he had gained enough of a bargaining position with his stand-out showings at the World Cup to negotiate an improved contract at the club. But Mourinho’s biting assessment of Pogba’s performances for France put the relationship back on the rocks. 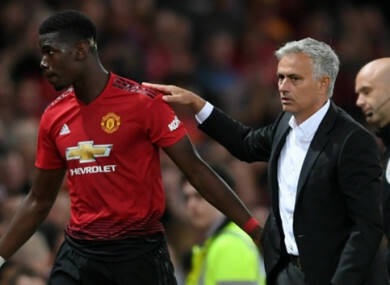 In an interview with ESPN during United’s summer tour the manager devolved responsibility for getting the best out of Pogba in a red jersey, instead questioning the player’s ability to keep control over his wandering mind over the course of a club season. “I don’t think it’s about us getting the best out of him, it’s about him giving the best he has to give,” said Mourinho. “I think the World Cup is the perfect habitat for a player like him to give his best. “Why? Because it’s closed for a month, where he can only think about football. Where he’s with his team on the training camp, completely isolated from the external world, where they focus just on football, where the dimensions of the game can only motivate. Talk that Raiola had been trying to peddle Pogba to Barcelona or Juventus was hardly surprising given such a stinging assessment, as well as an apparent desire to be considered the main man on the salary list as well as the field, and Mourinho’s fulsome praise on Friday appeared to be an attempt to smooth things over. And whatever else Mourinho might have attempted behind the scenes to clear things up, Pogba’s comments suggest all is very much not forgotten. Pogba clearly does not like the fact he has been so publicly undermined, not just when his form dipped slightly last spring but also on the back of the greatest moment of his career to date in Russia this summer. And while he is generally a person who tends to reject the opportunity to talk to the media after matches, the feeling has clearly grown so strong that he couldn’t keep his counsel any longer. In a sport which increasingly plays into the hands of players first and managers last, United are a club who have actively sought out big-game additions to boost their profile in recent years and will not want an icon like Pogba to remain unhappy for too long. That means that for as long as friction remains between manager and player there is likely to be an incredibly bright spotlight not just on the pair involved but also on the club and how they handle the fallout. Email “Paul Pogba v Jose Mourinho: What ‘things’ was the Man United midfielder referring to?”. Feedback on “Paul Pogba v Jose Mourinho: What ‘things’ was the Man United midfielder referring to?”.